Widely acclaimed algebra text. This book is designed to give the reader insight into the power and beauty that accrues from a rich interplay between different areas of mathematics. 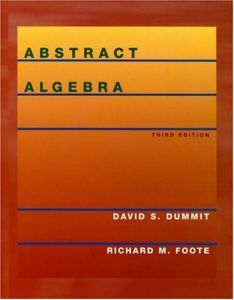 The book carefully develops the theory of different algebraic structures, beginning from basic definitions to some in-depth results, using numerous examples and exercises to aid the reader's understanding. In this way, readers gain an appreciation for how mathematical structures and their interplay lead to powerful results and insights in a number of different settings. * The emphasis throughout has been to motivate the introduction and development of important algebraic concepts using as many examples as possible.